SOOOOooo……. the Craft Festival is on this Sunday and we couldn’t be more excited. The talent on board is impressive. You can see a list of all the stands here. This event is Family friendly and is Free entry. We host over 60 stands of quality affordable contemporary design and handcrafted items. We boast that we are unlike other fairs and do not have much overlap in stands so you are not attending a fair with 50% of it filled with the same thing over and over again. Each vendor is hand picked and has gone through a rigorous vetting process in order to keep our customers high standards fulfilled. On the day as always we do a charity collection and raffle for Dublins homeless and collect winter woolies and toiletries to be distributed between soup runs and merchants quay. In the past people have been very generous with this and I know the receivers are very grateful. For more info on what we do check out this link…. The raffle on the day is always fun, we run a lucky dip style process where prizes big and small are given out all day long. Some prizes are well sought after while others are just a token from us to say thanks for supporting the good cause. Some prizes are also donated from our wonderful standholders and we can’t thank them enough for their generosity. We open to the public at 10am and finish up at 5pm. We are fully indoors so hail rain or shine , no excuses 😉 We are accessible by Dublin bus and Rail services. Check here for info on our location . There is a coffee dock and restaurant in the hotel for food. We have a few stands selling delicious edibles to keep you going on your way around the 60+ stands. While a few stand holders do accept credit cards, most do not have this service and bank machines are located at both ends of marine road. On street parking is free on Sundays, There is a hotel car park for easy access, this is not free. and I believe the shopping centre next door has weekend rates also if you wish. Many Standholders have specials on for this event and some specialise in personalised items so it is in perfect time to get orders in before Christmas. 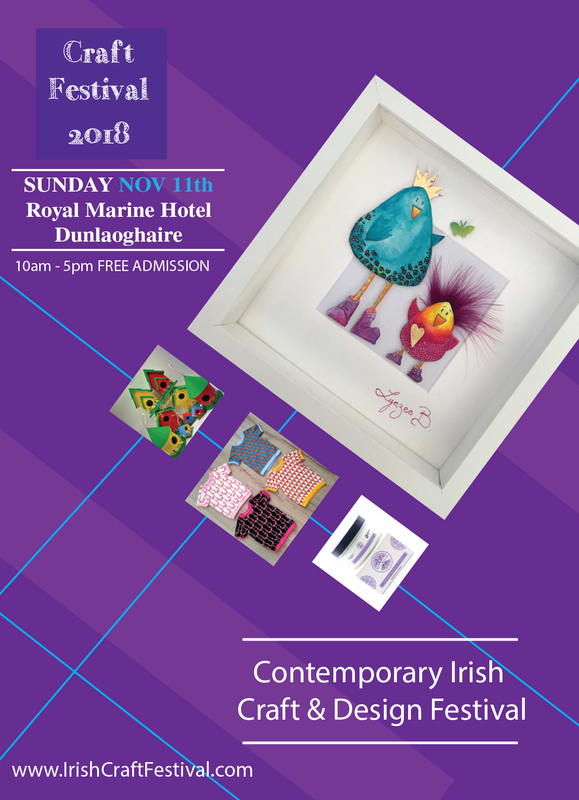 This entry was posted in Charity and tagged charity, christmas shopping, craft Fair, craft fair december, craft festival, dublin events, dunlaoghaire, facebook, free event dublin, prizes, royal marine hotel, simon community, stand holders, whatson by craftfestival. Bookmark the permalink.